What does a student look like when they’re not engaged in learning? Slack jawed? Sleepy? Distracted? Angry?…..Absent? And if they are engaged, what does that look like?…Excited? Talking critically about the topic? Full of ideas, enthusiasm and persistence? Anyone who has been a teacher probably has a gut feeling on what this looks like. 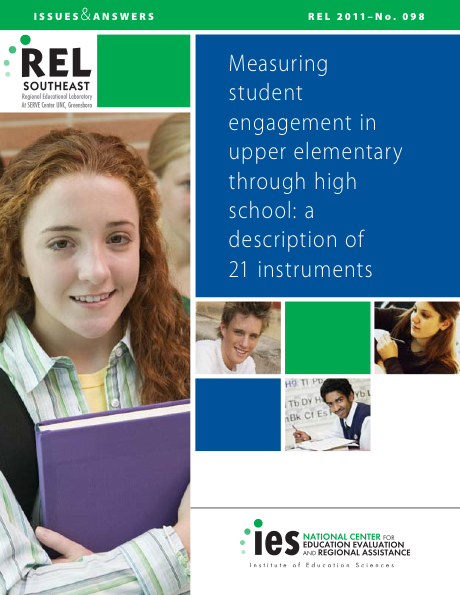 And now a report – Measuring student engagement in upper elementary through high school: A description of 21 instruments (from the Institute of Education Science) – has summarised 21 instruments that can be used to quantify the level of engagement in a learning experience, at intermediate and secondary level. Why? Because research is increasingly drawing links between engagement and achievement, particularly research exploring the impact of e-learning/learning through ICTs. So, in theory, if you can identify students’ needs, evaluate and track engagement, you might be able to explore reasons behind the data and intervene accordingly. Perhaps. The challenge, as this report acknowledges, is that engagement can be interpreted in different ways (social, behavioural, emotional…) – and the different tests measure different aspects. Which type of engagement leads to deep, transferable learning. Hmmm…. The most useful part of the report for me is the section that discusses the research behind engagement and it’s importance for learning to occur. The New Zealand Curriculum has engagement at the heart of its guidance on pedagogy – and while we may not be using psychometric tests to gauge engagement, we would do well to keep noticing where we see the excited faces – and the slack jaws – too. NextIf you think it’s too difficult, you’re right.